Can GOD Survive in Australia? Few would have thought to ask the question 25 years ago. Now, according to Bruce Wilson, author of Can God Survive in Australia?, the sun may be setting on organized religion in Australia. Why? IT'S NOT that Australians have suddenly begun flocking into the atheist camp. Not at all. Australia has been and still is by and large a Christian — professing nation. But what disturbs author Bruce Wilson is that since 1960 the God of traditional Christianity has rapidly become irrelevant to increasing numbers of people — as irrelevant, in his words, as ice boxes in a world that has invented the refrigerator. Though polls reveal some 80 percent of Australians "believe in God," the majority of them, Mr. Wilson says, behave as if God had little relation with their day-to-day affairs. Such an attitude was not always clearly obvious in that vast continent — nation. But the last 20 years or so have seen a tremendous change in the way the average person views religion. Some suggest that Australians are merely pulling away from institutional Christianity, of mostly European origin, in the interest of allowing a purely Australian brand of Christianity to develop. Others go so far as to describe what is happening now as a reemergence of the hostility some of the original white Australian settlers demonstrated toward religion. Still others say it is all a temporary fluctuation. Bruce Wilson minimizes such attempts at explaining the trend. He lays most of the blame for the religious decline at the feet of a phenomenon that has affected all the advanced industrial societies of the West: industrialization itself. The explosive increase in material goods; the leaps in scientific knowledge; the perception that man is self-sufficient; the interest in entertainment and leisure — such by-products of industrialization have pushed religion into the background, according to Mr. Wilson.. In this, the situation in Australia is not unique. Other voices have decried similar developments in other Western societies. Industrialization, they have said, is basically responsible for the eclipse of Christianity as a relevant religion. But is this a sufficient explanation? Is industrialization really to blame for the secularization of Australia or any other nation? And what does all this say about the quality of traditional Christianity? After all, if what is commonly referred to as the Christian church had been teaching the full and abundant way of life Jesus taught, industrial development would only have enhanced that abundance. God and industrial progress are not necessarily incompatible. A genuinely Christian society would have directed industrial development and made it work to the betterment of all mankind. The truth is, it is institutional Christianity that has left a vacuum that is being filled by materialism. The Christianity of the world has not shown how God is relevant. It has not explained what life is all about. It has not made known God's master plan for mankind. It has not preached the message of the government of God. "My people," God says of this very predicament, "are destroyed for lack of knowledge" (Hos. 4:6). Australians are known as a fun-loving people. One observer has remarked that "the most common objection of the ordinary Australian to religion is that it spoils his fun." True Christianity does not spoil any legitimate fun. The way of life Jesus taught provides an understanding of what real fun is. And a deeper enjoyment of it. It's too bad the ordinary citizen has never been shown that way. Dr. Hans Mol, who conducted a major study of religion in Australia, concluded: "The fact that such a large percentage of the Australian population does not worship regularly but still 'believes in God without doubt' and still holds the churches and the clergy in high esteem [not being aware of an alternative to traditional religion], fits the picture of ambiguity. "As in Britain the goodwill towards religion is counterbalanced teach by a massive woolliness of thinking about it. Australia seems to be a Christian nation in search of a religion; or a heathen nation in flight from one. Most Australians, like Englishmen, are obviously heathen, but wish they were not" (Religion in Australia, page 302). This "massive woolliness of thinking," this disease of the spirit, has been brought on by the fact that the churches of this world not only cannot agree among themselves, but they have been unable to make their doctrines agree with the verities of life. What theologians have made clear what God expects of Christians? Or, rather, is it that they "have not distinguished between the holy and unholy, nor have they made known the difference between the unclean and the clean" (Ezek. 22:26, Revised Authorized Version)? Doubt that the irrelevant God depicted by traditional religion can survive in Australia — or anywhere else — is fully justified. There is, however, another God now living in Australia — living, that is to say, in the lives of a small but growing number of individuals. These people have forsaken the world's way of doing things. They are learning a new way. God's way, as revealed in his spiritual law — the Ten Commandments. They not only profess to be Christians, they live the Christian life as taught by Jesus. They are happy, fun loving and at the same time sober minded because they have a serious mission in life — to prepare for the soon-coming kingdom of God and the restoration of God's government and his laws over all nations. 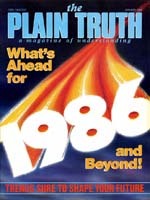 They have, in fact, made this magazine — The Plain Truth — possible, and free of charge. Their God shall survive in Australia — with no difficulty at all!